Overweight Americans are told to reduce or eliminate refined carbohydrates (white flour, rice, and sugar) from their diet. This includes most dry pastas even though billions of people eat pasta made from refined white flour and white rice daily and are not overweight or obese. Pasta eaten alone and raw has a high glycemic index that causes blood sugar spikes. These spikes can cause people to eat more food and calories than their bodies need. How can billions of Italians, Asians and other people eat pasta and white rice and not be overweight or obese if they are “bad carbs” according to the fad diet gurus? Diet experts assume you eat pasta like an American instead of like an Italian. For many Americans, a pasta dinner (especially a restaurant dinner) consists of a salad, toasted bread drenched in garlic butter or olive oil and a plate of spaghetti and meatballs. It all adds up to a 1,400 or more calorie dinner with a lot of refined white flour (bread and pasta). That is not the way Italians eat pasta. Southern and Northern Italians love eating pasta made with a variety of fresh vegetables. Meat is served as the entree. In fact, many fine dining restaurants in Italy serve pasta with farm fresh vegetables instead of tomato sauce and meatballs. 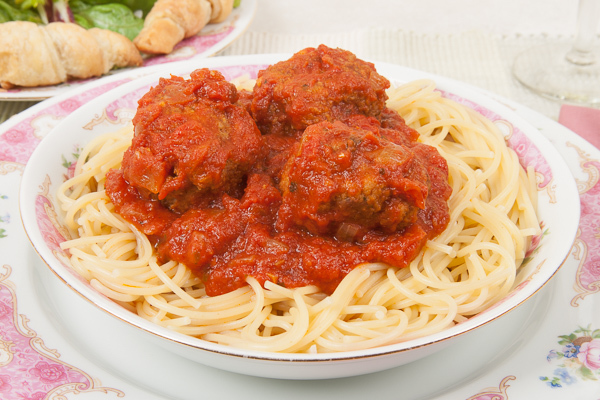 Spaghetti and meatballs is an American invention like pepperoni pizza. 20 Minute Pasta with Zucchini is a quick, healthy alternative to boxed or frozen pasta entrees. Cooking time is about 10 minutes depending on the pasta you use. Most dry pastas are al dente in 7 to 14 minutes. 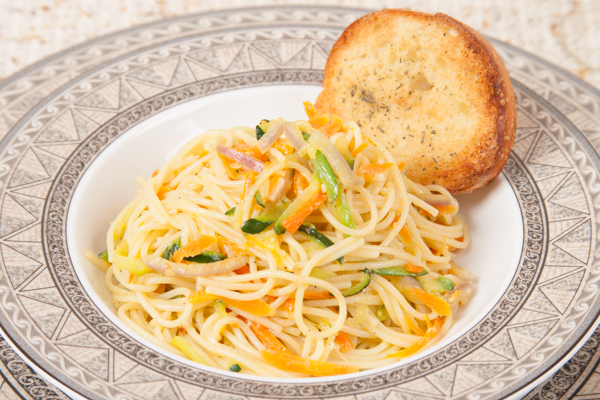 To reduce cooking time use thin spaghetti (spaghettini) or fresh pasta. Linguini and fettuccine take twice as long to cook as thin spaghetti. Prep the vegetables while the water to cook the pasta comes to a boil. Total prep and cook time is about 20 minutes. 20 Minute Pasta with Zucchini has about 350 calories per 9-oz. (260 g) serving. Add or substitute French-style green beans for the zucchini. For added color, stir in about 3-oz. (85 g) of halved cherry or grape tomatoes after stirring in the pasta. In a 4-5 qt/L sauce pan, bring at least 2 qt/L of water to a rapid boil. Clean and prep vegetables. When water comes to a boil, add salt if desired and the pasta, stir and cook per manufacturers recommended time until al dente. Meanwhile, heat oil in a large skillet on medium heat, and sauté onion and carrot about 1 minute stirring often. Stir in zucchini. Season to taste with salt and peppers. Cook stirring 5 to 6 minutes. Add a little pasta water if needed (pan looks dry). Cook vegetables to desired texture. Add drained pasta and about 1/4 cup of pasta water. Stir in the cheese until melted followed by the butter. Serve immediately.